Hana Gin— or maybe should I call it Hana G?— is the gin brand co-owned by musician Kenny G. Distilled at San Francisco’s Treasure Island Distillery. The Treasure Island Distillery shares an address with the Raff Distillerie who produces the grape based Bummer and Lazarus Gin. So the story behind Hana Gin is mostly tied to its co-owner. With a Jazz focus to its marketing campaign the spirit opts for an elegant simplicity. Distilled from a base of grain, it opts for a simple botanical blend: two kinds of citrus, the contemporary-gin staple Lavender, and Albanian juniper. Conspicuously, it eschews botanicals like coriander and many of the so-called fixative botanicals like orris root and angelica. The nose is simple, with floral lavender notes and clear citrus character. Very volatile, you can smell especially the citrus notes on the nose of Hana Gin from quite a ways away upon pouring. As it sits though, the citrus bubbles off leaving a delicate sweet, orange blossom aroma. The palate is highly concentrated specially in the top notes. Lots of orange and lemon early. There’s a curious, minty coolness on the mid-palate with a vague floral, black raspberry sort of note hovering as well. Juniper is quite subtle as well. The finish is quite short. There’s a very brief appearance of orange zest; however, Hana Gin mostly finishes with the acerbic flavor of neutral grain spirit. The flavor is nice at first, but it’s highly concentrated in the top. Hana Gin lacks balance, especially as there’s really no botanical presence in the finish. Hana Gin works well in a Gin and Tonic, especially as the quinine will add some bitterness and character to the finish. In a Martini, the harshness at the finish will still be evident. 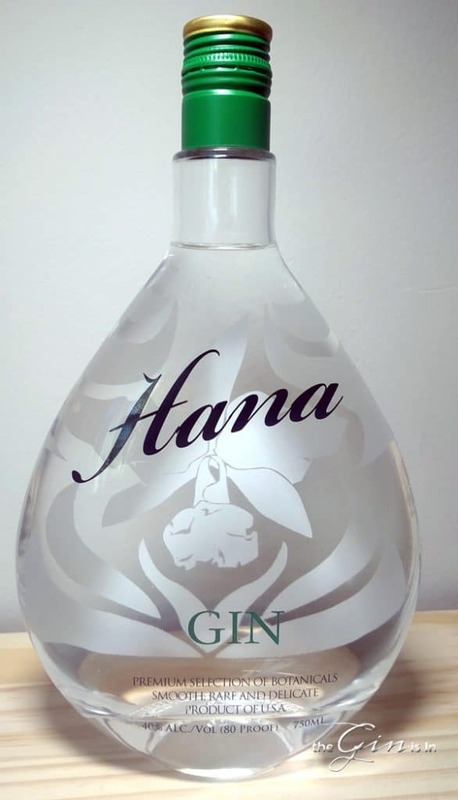 Best suited as a mixing gin, Hana Gin needs other ingredients to cover up its lack of depth. Bartenders will find it an easy sell to fans of contemporary style floral gins, such as Hendrick’s Gin, but more serious fans of gin will likely find it a bit surface-level and lacking. Hana Gin seems designed to be competitive in the non-premium contemporary gin space. It’s sold at a very competitive price and has a flavor profile that’s certain to appeal to those who might be coming over to gin from the world of flavored vodka. And while that’s a worthwhile pursuit, Hana Gin seems more aimed at the New Amsterdam Gin market than the Hendrick’s Market. With a bit more depth, Hana Gin has some promise, but the lack of detail and depth ultimately makes it a good buy, but an average gin.